Perhaps you don’t know yet what calçots are, but you’ve almost certainly smelled them if you’ve been walking in the streets of Catalonia lately and caught a whiff of burnt onions. Don’t worry, nobody has left the stove on, we’re just cooking calçots! 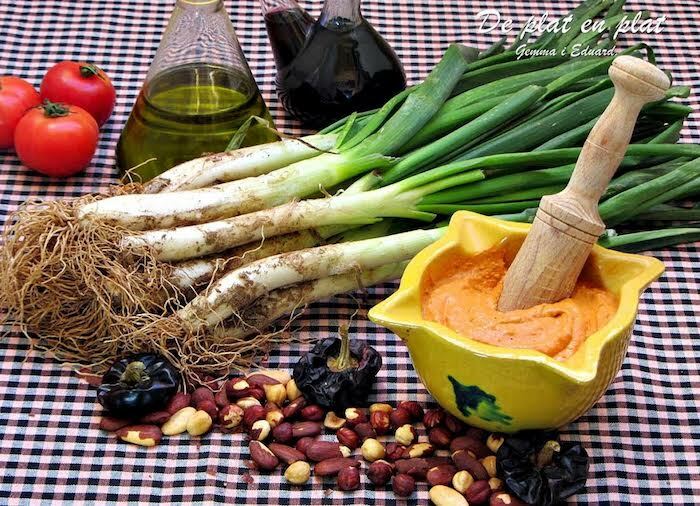 It is known that us Catalans love any reason to host a get-together with friends and family, and in the winter months, calçots are why people come together and eat. To visitors of Barcelona, this may seem baffling: how can there be so much excitement behind a scorched onion? 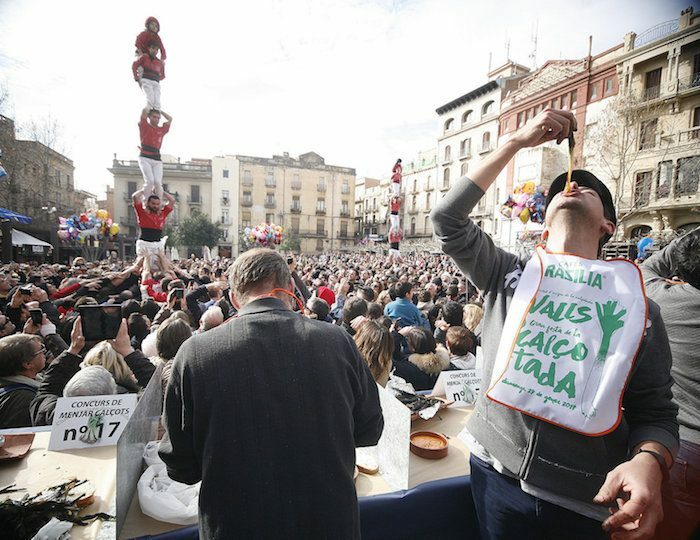 Well, read on to learn more about this distinctly Catalan tradition! Calçots (pronounced: kal-SOTS) are a Catalan delicacy originating from Tarragona, and is somewhat of a cross between a scallion and a leek, that can grow to about 25 cm long. The annual harvest is during the winter season, from January to April, and is celebrated with “calçotadas”, where friends and family gather around to eat this wildly popular dish. The calçots are bundled tight onto an open-fire grill, and charred for about five minutes on each side until blackened, then wrapped in newspaper to keep warm and served on a red terracotta roof tile – an absolutely humble and no frills dish, and oh so tasty. 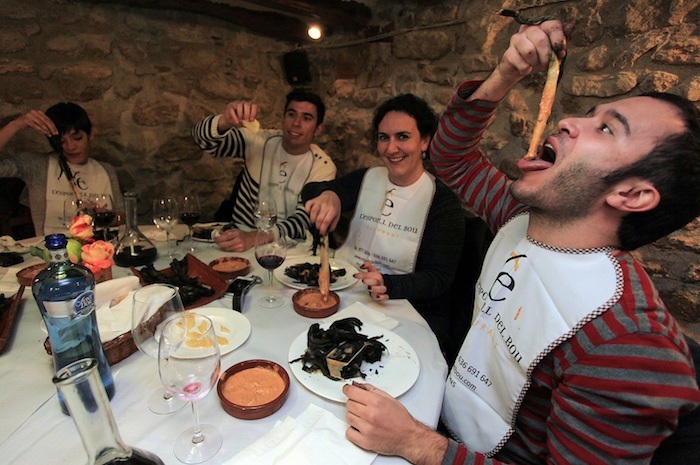 The ritual of eating calçots is messy business, but that’s half the fun! Roll up your sleeves, put on your paper bib (yes you’ll look a bit funny but so will everyone else) and get started by peeling the charred black layers of the calçot off piece by piece, until you get to the tender sweet pearly white center. Dunk it generously into the bright red romescu sauce, dangle it over your head, open wide, and chomp right into it. By the end of it, you’ll smell of onions, and have dirty black hands, plus a messy red-stained bib to wear as your badge of honour! To make a full “calçotada” feast out of it, some restaurants offer a “Menu Calçotada” option, here you get calçots with romescu, plus a choice of barbequed meats like “butifarra” sausages, lamb or veal. Some establishments include toast, white beans, potatoes, and maybe even desserts like catalan cream, or honey with cottage cheese. All of the above is usually offered for a very reasonable price of 25 – 35 euros per person, which will leave your belly full and satisfied. Wash it all down with a “porró” or two of local red wine too. Located off the beaten path near an equestrian club in Sant Cugat del Vallès, this family farmhouse dates from the 14th century and has a wonderful mix of modern and rustic design, with a backdrop of beautiful green fields and countryside. Outdoor seating available. Offering rustic and hearty Catalan fare, this typical Masía catalane specializes in calçots. It’s charming fireplaces and wooden ceilings will transport you back in time to the 13th Just a 15 minute drive from Barcelona. Catalan cuisine with an idyllic setting in the heart of the Collserola National Park. Oak embers are used in their open-fire grills to give the calçots a wonderful smoky flavor. Their elevated terrace offers a magnificent view, and is surrounded by ancient trees and garden, giving a sense of privacy and serenity in the hustle and bustle of the city. Park Güell is nearby for an after dinner stroll. Opened since 1970s, their checkered tablecloths, and wooden chairs will have you feeling just as if you’re in the countryside, with the convenience of being located in Gràcia neighbourhood. Just two blocks from Las Ramblas, this is a wonderful little restaurant tucked away in a side alley, with affordable prices and friendly service the establishment is frequented by locals. Have you tried calçots yet? Let us know what you think in the comments below!